It was early. My knees felt creaky. The coffee was still burbling through the filter. And I was in the kitchen, gathering ingredients to make gluten-free chocolate chip cookies. The night before, Danny and I cooked a dinner for 4 wonderful people who donated to our Kickstarter. He danced in front of the stove, that little shuffle heel to toe he does when he’s boppipng around happy. We made soft pretzels with our guests — Grace requested them in particular — and watched them bob in the boiling water filled with baking soda, then put them in the oven to bake. There was a spring-green soup, then pretzels warm out of the oven, with mustard for dipping. Sauteed halibut with spring vegetable risotto on a mint-pea puree. Chicken roasted with goat cheese and asparagus with potato puree. And a roasted rhubarb and strawberry shortcake. Our guests left happy. We loved them and the experience of feeding them. But I woke up the next morning feeling a litle worn. We forgot to put the mats down on the kitchen floor after sweeping, so Danny and I spent the entire evening walking on the concrete without that padding. Man, my knees are making it clear to me — I am getting older. I wanted nothing more than to sleep in on Sunday morning, drink coffee slowly, and read the paper in the sunlight. Time to bake. We had an appearance in Seattle to make. I melted coconut oil on the stove. I pulled sugar and baking powder out of the pantry. I left the eggs on the counter to come to room temperature. Coffee ready — time for a sip. And then Lucy woke up. I gave her a hug, tousled her crazy bed-head hair, and asked her if she wanted anything to eat. “What are you doing?” she wanted to know. We bake together. We have for years. But we don’t usually bake that early in the morning. I told her about the cookies we needed to make for the appearance that day. She wanted to help. She dragged a chair over to the counter and started stirring the sugar into the melted coconut oil. Danny came down the stairs with Desmond in his arms. D started wriggling, smiling so hard his nose crinkled and his eyes closed. Lu reached up to hug him, then returned to stirring. Cups of coffee for the adults. Slices of apples for the kids. We put on some Caspar Babypants and started dancing around a little. We opened the windows. Lucy cracked the eggs, slowly slowly stirring to make sure every inch of yellowy striation disappeared into the dough. I reached down to hug her, tears in my eyes. Who cares about creaky knees? And early mornings? And the time I could have spent with the New York Times? I was right where I wanted to be. This is the recipe for chocolate chip cookies printed on the box of our gluten-free all-purpose flour. We could have put a dozen other recipes on there. But there’s something quintessential about chocolate chip cookies. They’re easy to bake with kids. And they never fail to please, especially in the late afternoon, when school is over for the day and there is playing outside to do. This recipe is based on the classic Toll House recipe, which is still most people’s favorite chocolate chip cookie. The edges are crisp and set, the centers are slightly soft and oozy with melting chocolate. These disappear quickly. 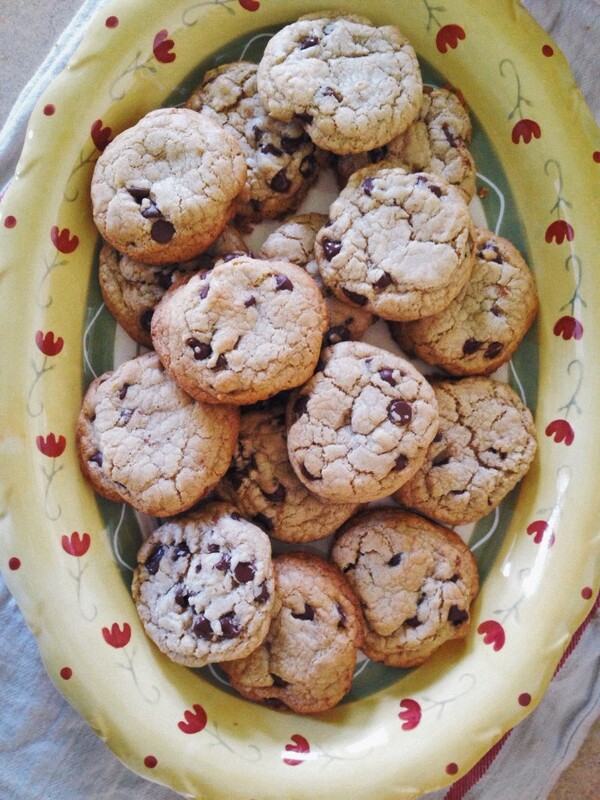 If you want to make these dairy-free, all you have to do is use coconut oil instead of the butter and be sure to use a dairy-free chocolate chip. They’re just as good as the butter kind. If you want to make a quick version, then make the batter and spread it in a greased 9 x 11 baking pan. Bake it at 375° for 30 to 40 minutes. Chocolate chip cookie cake! Of course, we think these work best with our flour. That’s why we created it. We wanted to create a great baking flour that would work for your family. We’ve made it easy for you. This could be your flour. Combine the dry ingredients. Whisk together the flour, salt, baking powder, and soda in a large bowl. Set aside. Make the batter. Cream the butter and sugars in a large bowl. Add the eggs, one at a time. Add the vanilla. Stir in the dry ingredients, a bit at a time. Add the nuts (if using) and chocolate chips. Prepare to bake. Heat oven to 375°. Bake the cookies. Drop golf-ball-sized balls of dough onto a parchment-lined baking sheet, making 3 rows of 2 cookies on the sheet. Bake until the edges are crisp and the center still soft, 8 to 12 minutes. Pinch a bit of flaky sea salt over the top of each cookie, if you want. Cool for 10 minutes, then remove from the baking sheet to a cooling rack. Serve as soon as you can. A most lovely read Shauna. Do you know when your flours will be available in Canada? I feel like I could reach out….you are sooo close, just across the waters from our sunny Sooke, B.C. region. How did people like the cookies? Lucy must have been thrilled to see people eat her food! Ahhhh….I love it when you write like this! My daughter was my son’s favorite person when he was a baby & she was two years older. It both charmed and galled me (though mostly charmed…it was the lack of sleep that made it sting). I second the question about Canadian availability…. I’m in Vancouver BC and would love some. I’m considering shipping to Point Roberts, but am having a hard time imagining the trip across the border to pick up delivered flour…. maybe in the summer when a trip to the beach also makes sense. Lovely piece, lovely picture. Thank you so much. Reminds me of baking with my children when they were small, and the empowerment we give our children to love and to create. One of our sons –the one who loves to bake—has, since my diagnosis 3 years ago, perfected his method of baking a small amount of safe cookies for me while making the rest of the batch non-GF for the rest of the family. Little things like that, that aren’t necessary, but do feel very necessary in an atmosphere of love…. And I’m sure he’ll want to try your recipe here, too! awesome snapshot. 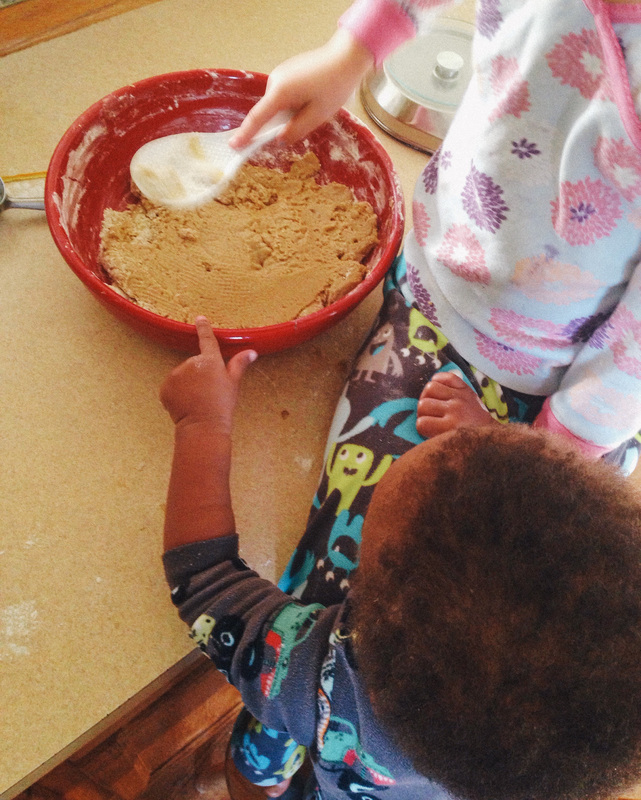 i love baking with my little ones (and can’t wait to try it with your flour). This is the Nestle Toll House Cookie recipe. Yes. That’s what I said. It’s based on the Toll House recipe, but made gluten-free, since so many people love that recipe. We’re showing folks you can still have your favorite recipes with our flour. I made my favorite peanut butter cookie recipe from the Better Homes and Gardens Cookbook (red-white-plaid) with your new GF flour, they tasted the same (or better!) as when I was a kid. 😀 I’m really liking the millet flour (nutty-flavor) in the flour blend. I *ADORE* your stories. I have been reading your gorgeous mini works of art almost from the start and while every story pings me, some ring long and loud in my heart. This “Right Here” is what I am talking about. Normalcy stuffed to the seams with joy, warmth and love. Thank you for sharing so much with us. Re: Your flour. $12.50 just for SHIPPING? Well, that’s how much it costs to ship those boxes to you. we’re not making any money on that part! Sorry it doesn’t work for you. I would love to try your flower but it seems exorbitantly expensive! . Do you think you’ll ever have your flour and regular markets? Sorry for errors, using voice feature to type iPhone leads to some unique spellings! In fairness to Shauna and the chef, their price isn’t that expensive. Not when you add up the cost of each individual flour you’d pay for in the stores. It may actually save you money. Love the recipe and the story behind it. The picture of Desmond and Lucy is priceless. I guess I know what I’ll be making this coming week. Not to be obnoxious but I buy all purpose GF flours and GF flour mixes for cookies and cakes and breads that are under $4 per bag. I’m sure Shauna’s flour is lovely but for a lot of us we can’t justify $12.50 shipping on top of the cost of the flour itself. However if it makes it onto supermarket shelves and is competitively priced I will be trying it! I made the cookies and they came out great. You know the best part I only opened one box of flour. I have always followed your GF flour mix and made my own because it worked in my recipes. I used several of the other boxed flours but they did not work as well for everything. I made another batch of Ina Garten’s Blueberry Muffins 2012 version and again they were wonderful. I am going to order some more flour and make the carrot cake next. Thank you for creating this GF Flour and I will pay almost anything to keep it on my shelf. Thank you so much, MaryAnn! This made our day.